I have a skin condition called Vitilgo. Vitiligo is an autoimmune disorder that causes pigment to disappear. My body is scattered with randomly shaped patches and spots that have lost all colour. I’ve named them my islands of white. Thousands of people are living with the condition in varying degrees. 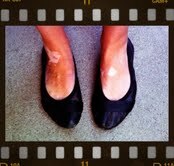 Although it is purely cosmetic with no other sinister symptoms, Vitiligo can be deeply debilitating. Self esteem can disappear along with the pigment, leaving many people who have the condition feeling odd, unusual, self conscious – sadly uncomfortable in their ever shifting skin. Like countless others, people with Vitiligo have to confront on a daily basis an aspect of themselves that they might wish to be different. Plenty of us wrangle with our perceived flaws, spending precious time daydreaming, “If only I didn’t have_____ ” Fill in the blank. It is especially challenging in a media driven society that is intent on disseminating such a limited and superficial vision of beauty. We are all of course multi dimensional. But defaulting to defining ourselves by one narrow element is a trap that can easily snare even the most self aware. If we put all our weight constantly onto only one leg, we will most probably begin to feel a nagging ache in our hip. We will be off balance. Not unlike giving constant attention to negative aspects of ourselves, while disregarding our strengths and skills. Something, somewhere inside of us will suffer. Shift the balance. Centre yourself. Think on aspect of yourself that you are dissatisfied with or that you try to wish away. It can be a physical feature, a medical condition or a personality trait. Write in detail about that aspect of yourself. Spend time reflecting on how it has affected your life. Are you self conscious? Does it stop you from moving forward? Are you worried about other people’s judgment? Now think of an aspect of yourself that you feel good about. A strength. A quality or feature you have been complimented on and feel proud of. How has it benefited you? Give this part equal time and attention. Be specific.